Robert R Sutherland of Garscube Harriers and Birchfield Harriers was probably the best unknown runner that Scotland has ever had. 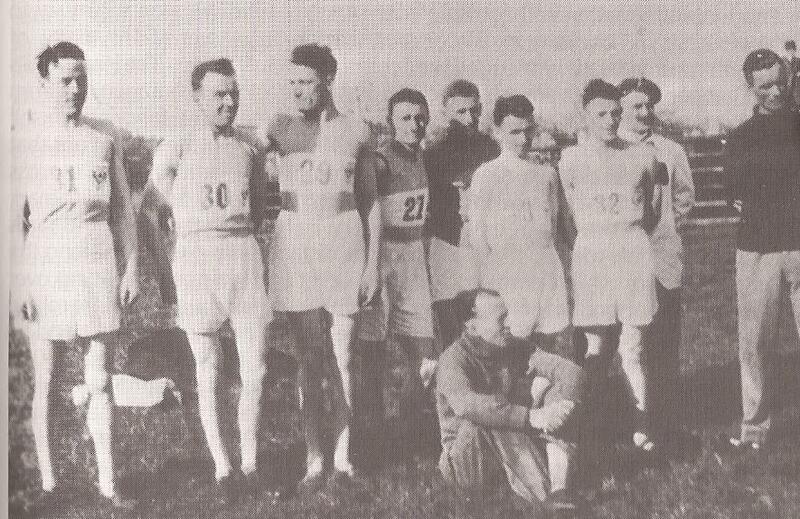 Seven cross-country international appearances (first Scot to finish three times), two silver medals in the ICCU International, three silvers in the Scottish cross-country championships, 14 Army Championships, 5 inter-services championships, twice third in the English Cross-Country championships, three times fifth in the same championships, and as a member of Birchfield Harriers led them to the team championship seven times in eight years. And he is not known at all in Scottish cross-country circles. His problem? He was running at the same time as Suttie Smith and Jim Flockhart. In summary, his cross-country feats included twice second in the International Championships where he was first Scot to finish three times and seven appearances in ten years in the International team. On the track he he won the Scottish four miles title twice being the only man ever to get under 20 minutes for the championship and third in the AAA’s championship, as well as winning the national steeplechase championship. Sutherland first came to prominence in the National Cross-Country Championship of 1928 where, finishing fourth, he won the National Junior title. Colin Shields says, Lance-Corporal Robert R Sutherland of the Scots Dragoon Guards, running as an individual for Garscube Harriers, finished fourth and gained the National Junior title. 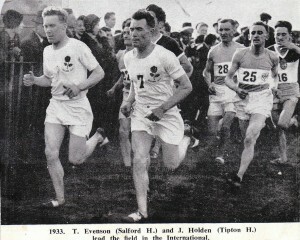 Sutherland, a Govan man, had own the British Army 10 mile cross-country championship just seven days earlier and was to run in the English National a week later for Birchfield Harriers with whom he was to win many English team honours.” In the international itself he finished eighteenth and third Scot behind Suttie Smith (second) and Frank Stevenson of Monkland Harriers (fourteenth). The Thirties were completely different with six medals gained – one gold from James Flockhart (1937), three silvers from Robert Sutherland (1930, 1933) and WC Wylie (1935) and two bronze medals from J Suttie Smith (1933) and Alex Dow (1936).” He goes on to mention that one of the two memorable high-spots was in 1933 when Sutherland and Suttie Smith finished second and third behind England’s Jack Holden. In the English National, he had come twelfth and was a member of the winning Birchfield team. 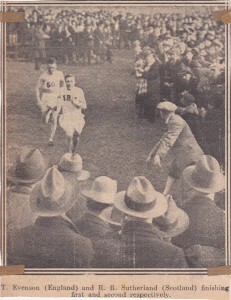 The finish of the international; in 1930: see how close Sutherland was to Evenson, the winner. 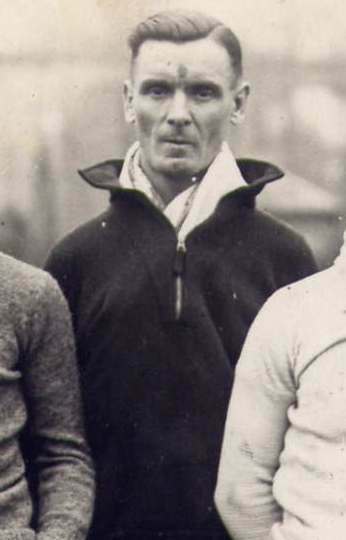 Colin Shields reports that after running so well in these races (three quality long distance races in fifteen days), Sutherland was invited to race in an invitation race in Paris on 30th March. There were 1600 runners and over 7 miles. Would you believe it – Sutherland was second only one second behind the winner! A superb season but he could be forgiven for thinking that it was not his year. Calling him the great unsung hero of Scottish cross-county, Shields remarks that it had been a daunting programme but one that Sutherland repeated regularly over the next few years with great success but little recognition as he never won either the Scottish or English nationals or the international any of which would have won him eternal fame and inclusion in the cross-country record books. 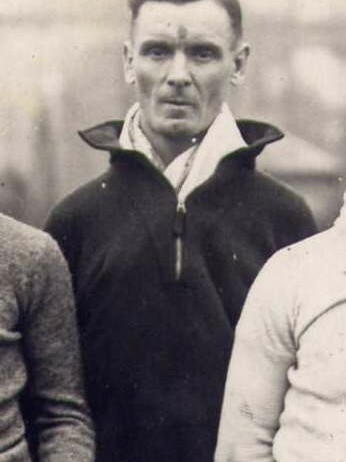 The National championships in March 1931 were again at Hamilton and Sutherland was second. In the English Championships however, he was third finisher and led Birchfield to the team title. In the ‘Herald’ we are told that in the international, Sutherland was thirty fourth at the end of the first lap finished in eighth place. Scotland and France were equal second. Summer 1931 was another good one for him. He again won the SAAA Four Miles title -this time in 19:59.8 which was the only time that twenty minutes was beaten in this championship. Season 1932-33 was the one which was to be Jim Flockhart’s big break-through season – Sutherland had been second to Suttie Smith since he came into the sport and here was another phenomenon! It is probably not stretching it too far to say that those three – Smith Sutherland and Flockhart – were probably the best in Britain throughout the 30’s. Some, including Alex Wilson would beg to differ and say that Jack Holden (who won the ICCU Cross-Country title four times between 1933 and 1939) was THE top man but they’re at least in very good company!Sergeant Sutherland was fourth in the National in March 1933 behind Flockhart, Wilson and Suttie Smith. One week later and he was third in the English National and again Birchfield won the team race – for the sixth year in succession – and again Sutherland held back from the early pace and came through on the last lap to finish 14 seconds behind the winner. The 1933 international was held in heatwave conditions and Flockhart injured his foot leaving the battle to Sutherland and Suttie Smith. They ran the final two miles together with Sutherland proving the stronger and finishing second with Suttie Smith third. In summer 1933 he again won the SAAA Four Miles title – this time in 20:24 – before heading into the 1933 – 1934 season. In the National in March 1934, there was another silver medal for Sutherland who was 150 yards behind Flockhart. In the English championship he was sixth individual, first Birchfield Harrier and the team again struck gold. 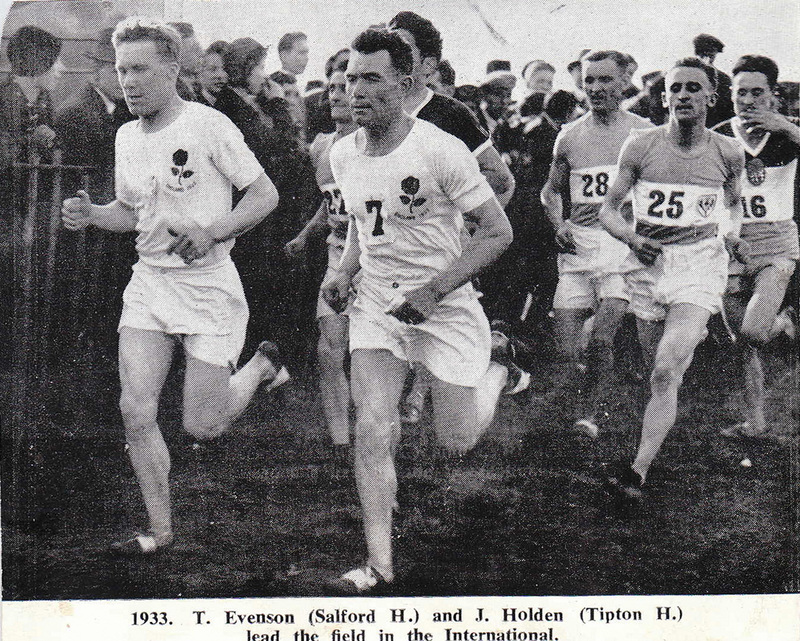 In the International Championship Sutherland was sixth and second Scot to finish but the ‘Glasgow Herald’ felt obliged to say “Sutherland obviously felt the strain of his mud-week race in the Army Championships, this being his fourth big race within the month.” The Army 10 mile cross-country championship in the middle of the week leading to the international would hardly have been ideal preparation for the international championship. In March 1935 he missed the National in Scotland and the International. The reasons for this are not clear but he was back in 1936 and ran a very good National in March 1936 to be second to Flockhart. Not mentioned in the exceptionally short ‘Herald’ report on the English National (which did mention that Birchfield who had lost their title in 1935, won it back again in 1936). On a very warm day in Blackpool for the international Sutherland finished fourteenth after running in tenth for much of the race, to be second counting runner for the third placed Scottish team ahead of both Flockhart and Suttie Smith. The SAAA Steeplechase championship had been first run in 1934 and Sutherland took part in and won it in 1937 in 10:59.9. With his height, natural strength (4 major cross country championships in one month almost every March) and speed as demonstrated in some of the fast finishes and pace over the 4 miles distance, it might be thought that he would have been a natural for this event. It would have been interesting to note what he could have done earlier in his career. The following winter he was third in the National championship 9 seconds behind second placed Emmet Farrell: needless to say Jim Flockhart took the title. In the International in Belgium, the big talking point was the Scottish victory by Jim Flockhart while Sutherland was twentieth and third placed Scot in what was to be his final cross-country championship in the blue of Scotland. He had had a superb career – one that 99% of athletes could only dream of – with individual gold medals on the track and in Army championships, team golds in the English championships, silver and bronze individual medals in Scottish, English and international championships as well as several fine runs in other events. I am indebted to Alex Wilson for the following information on Sutherland’s track career. “Robbie’s pb for the mile was 4:26.4, set when winning the 1930 Army title at Aldershot; his pb for the 2 miles steeplechase was 10:29.0, set when finishing runner-up to WC Wylie in the 1937 AAAs; and his pb for 6 miles was 30:50.0, set when finishing runner-up to Jack Holden in the 1933 AAAs. He was nothing if not versatile! I have in my notes (maybe from Birchfield historian Wilf Morgan, I`m not sure!) that he was an Army PE instructor. His Army chores were such that much of his time was spent in the gymn demonstrating and lecturing on a variety of sports including boxing.